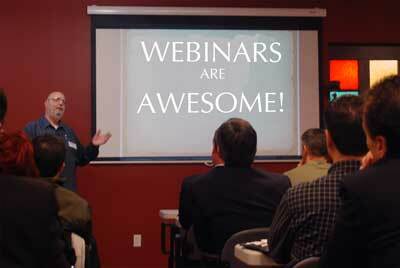 Webinar events can be of huge benefit to any organization’s event offerings. Tear down geographic boundaries by taking your event to your members, reaching a larger audience than possible before. A reduction in travel expenses lightens up your budget, and the green aspect of eliminating all those vehicle kilometres lightens up your conscience. Will your event be in-house or in a separate venue? In-house provides more control over the technologies, but requires increased investment. If the event is to be held at an external venue, it is important to ensure that all the requirements listed below will be covered. Will your audience be entirely online, or will you welcome additional in-person guests? Bringing in an in-house audience adds a dynamic element to the presentations that your presenter will appreciate, but requires significant investment into infrastructures to facilitate effective interaction. We call these Hybrid Events. High-speed internet is a requirement, not an option. Broadcasting audio, video, and presentation materials consumes a significant amount of bandwidth – to ensure a smooth presentation for all participants, ensure you are running on a high-speed and preferably wired (vs. wireless) internet connection. I recommend at least a 3.0mbps upload speed for a live event (fun fact: visit http://speedtest.net/ to test your internet connection speed). There are a lot of software providers that offer webinar services, including Webex, GoToWebinar, Adobe Connect and more. Many of these providers offer free trial services; try them out until you find the one that offers the right amount of functionality for your requirements. Also, be cautious of providers that require your participants to download additional plugins – participants behind strong firewalls, such as government employees, may be unable to download plugins required to participate. Audio quality is a crucial component to offering an enjoyable user experience. Do not use the built in microphone within your camcorder. Invest in high quality microphones, either USB Connections or pro-audio microphones connected through a sound-mixing board, depending on your requirements. Will you be bringing audio in from your online participants? If so, ensure that you have the technical ability to receive audio, including speakers for your presenter to hear their comments. Additionally, ensure that in-person attendees have access to a microphone to share their comments with those online. Video quality is another important aspect of end-user experience, of only slightly less importance than audio. While HD video is appealing, many webinar providers won’t support the broadcast of HD video due to bandwidth requirements. Instead, focus on software that allows for the broadcast of a higher frame-rate as opposed to resolution. A smooth video at 30 frames-per-second will be much more effective than HD-video that is jerky and/or lagging. If you are allowing your attendees to participate via webcam, ensure that you have the technologies in place to facilitate this, including a screen for the presenter to view them. In order to protect your assets, ensure that all broadcasts and recordings are accessible for authorized users only. For live webinars, ensure that only those registered can access the broadcast stream – implementing a user login is an easy way to ensure that only paid attendees can participate. For educational sessions and event recordings, make sure to protect all sensitive web content from download – utilizing digital rights management (DRM) can prevent users from downloading the training materials and sharing with their friends. Have at least one individual dedicated to managing the online environment. This person should wear multiple hats to handle all aspects of the online portion of the event. The moderator will act as a technical assistant to the presenter, allowing him/her to focus on delivering the presentation at hand. In addition, this person will ensure the experience is optimized for online attendees and will deliver a more enjoyable experience that supports repeat attendance. Chances are some members will experience difficulties accessing the webinar event. Regardless of how many instructional diagrams, PDFs and videos you distribute in advance, your audience will still identify possible roadblocks. Make sure that you have a phone number clearly listed in all communications, including the login screen if possible. Make it easy for people to express their difficulties to you, instead of sharing their complaints publicly. Why not get two birds with one stone? Record your session and post produce it for those who couldn't make it in. Great web content and potential pay-per-view revenue streams await you, as long as you remember to hit that red button. I know it seems daunting, and it can be. But delivering high-quality events will get your audience behind you as you continue to refine your offerings and provide valuable member events.